“This is a 60 minute sequence of images, which I captured using a 20-inch telescope,” says Peach. Gault’s tail may be a result of a recent collision. Researchers with the ATLAS project have looked at images of Gault in Dec. 2018 and Jan. 2019. Extrapolating its appearance backwards in time, they suggest that Gault hit another object in the asteroid belt in Nov. 2018. If that idea is correct, the tail would be debris from the crash. Readers, would you like to take pictures like Damian Peach? He’s willing to teach you how. Subscribe to his Patreon page for expert tutorials. You can have it for $99.95. 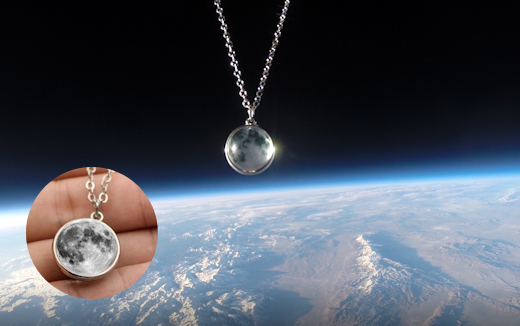 The students are selling these spherical glass pendants to support their cosmic ray ballooning program. Each one comes with a Valentine’s card showing the pendant in flight and telling the story of its journey to the edge of space and back again.